MaxSoft > Software Development > MaxSoft Receives Top Honors on Clutch! Project management has never been easier than with our team at MaxSoft. With the arsenal of services and solutions under our belt, MaxSoft is the ideal partner for any and all technological needs that our clients may have, especially in terms of web, mobile app, and custom software development. We pride ourselves on our quality, efficiency, and dependency as a trusted provider and partner to our clients, and we are happy to share that others have taken note of our work as well. MaxSoft was recently named one of the top web developers in Bulgaria! This highlight of our service, performance, and work comes from Clutch, a business insight firm in Washington, D.C. that researches and reviews B2B companies like MaxSoft. Each company studied by Clutch is evaluated on their market presence, previous experience, client satisfaction, and quality of work. They publlish rankings of service firms after comparing the performance and quality of different firms on their platform. 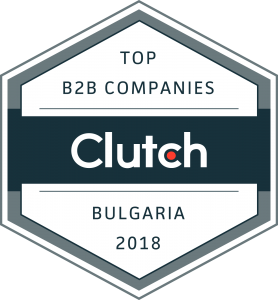 With the extensive research that Clutch conducts, MaxSoft is very proud to have been featured as an industry leader in the web development category on their latest report of the top Bulgaria firms. Our team also wants to thank our clients for their support and partnership, especially in terms of the reviews left on our Clutch profile that note our professionalism, diligence, and commitment. We always look for new opportunities to partner with new clients and continue our legacy of quality product, long-lasting relationships, and efficiency, so we welcome you to connect with us if you are interested in collaborating with MaxSoft. We also have been highlighted as one of the top app development firms in Bulgaria on the Manifest, Clutch’s sister website. Our team is more than happy to help you build and better your business. We’d like to thank our clients for their recognition and support of our work and look forward to maintaining our position as a leading service provider in Bulgaria!